The history of plans to develop Ann Arbor’s Library Lot goes back literally decades (see the 1991 Luckenbach study). But most recently, as documented in our long blog series listed on the Library Lot Conference Center page, the effort to develop the lot hinged around RFP 743. The first post of this series described the making of the RFP (released on August 14, 2009). At the end, it all came apart, as mostly described in the last post of the blog series on the conference center. On April 4, 2011, the Ann Arbor City Council passed a resolution that terminated the RFP and the sole remaining proposal from Valiant Partners was conclusively rejected. But at the same meeting, Council established a new process for the downtown surface lots. In a not-so-tacit recognition that the city-directed RFP process had undergone a fairly spectacular failure, the Council asked the DDA to take it on. 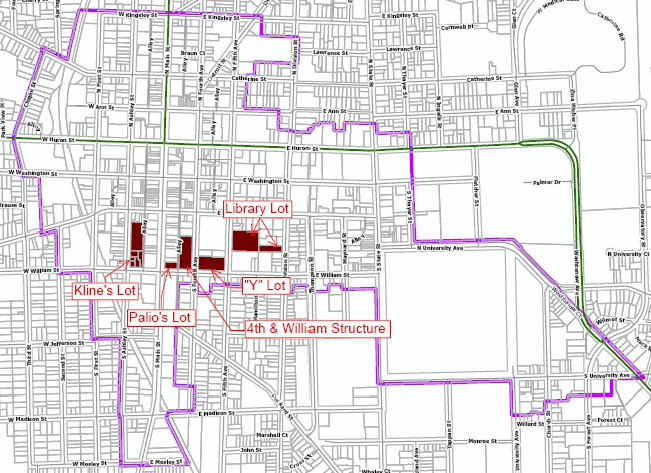 But the area assigned to the DDA was not the entire city, but rather the city-owned lots in the area south of Liberty. As the Chronicle details, the June meeting appeared to set the Partnership Committee up for a vigorous, proactive approach to a broad downtown planning exercise. Doug Kelbaugh (a UM professor familiar to many long-timers as instrumental in putting together the Calthorpe process) and his colleague Kit McCullough submitted a brief proposal involving some brief but substantial public participation. Peter Allen did one of his typically scintillating presentations (Allen sometimes seems to be several places at once when speaking to his elaborate schemes), based in part on his talks with many community leaders. He emphasized the many community connections that he would draw upon and stated that he would like to see a 20-story building, to be the definitive Ann Arbor skyline object, on the Library Lot. It seemed that Allen and Kelbaugh were competing to some extent for the job of the “consultant”. Meanwhile, at the June meeting there was also some substantive discussion by Albert Berriz and others at the table (described by the Chronicle). Susan Pollay stated that the July committee meeting would be an intense retreat-style meeting at which the group would make real decisions about setting the course for the process. Today’s Partnership Committee played to a full house. Not only were there many citizens in the audience, but McCullough’s UM class, Josie Parker of the AADL, Peter Allen, Kelbaugh and McCullough, and someone making a video tape. The result was anticlimax. The expectant audience waited for several minutes before a diminished committee took their seats. The meeting was chaired by John Mouat in the absence of both the co-chairs (Russ Collins and Sandi Smith). No experts were called to speak and Allen, Kelbaugh and McCullough were never mentioned. Committee members spoke in generalities and the entire meeting seemed conducted under water, so slow and vague each step was. Mouat spoke admiringly of a couple of other recent plans (the Urban Forest plan and the AATA’s Transit Master Plan) as examples – and meditated aloud on how a community can reach consensus. He expressed a dislike of the very word “development” and said that he didn’t want the development community to be too closely linked to the process. Some reference was made to RFP 743 (the sad example that put the current process in place). Susan Pollay astonishingly characterized it as “an abbreviated council RFP process that never got very far”. She also made a point that the city needs to indicate to developers what incentives will be available. The Valiant Partners, she said, came in with lots of ideas of what the city could do for them “only to have the community recoil”. Ably put, that. Joan Lowenstein also brought out a very cogent point, which is that the city has tried to achieve every possible goal in past RFPs and that this is not realistic. But in general, there was no instrumental discussion at all. The group seemed literally to be trying to last out the clock. They did succeed in instructing staff (Pollay and Amber Miller) to put together a timeline for a process of about a year. The subject will also be added on to a working session that the DDA has already scheduled with Council for October (principally about parking). What happened? Clearly something has interrupted the headlong progress toward a comprehensive downtown planning process. Audience members gathered in small groups afterwards to ask each other the meaning of it all. We didn’t have answers. UPDATE: See the Chronicle’s more complete coverage of this meeting. This entry was posted on July 13, 2011 at 7:22 pm and is filed under civic finance, Downtown, Sustainability. You can subscribe via RSS 2.0 feed to this post's comments. You can comment below, or link to this permanent URL from your own site.